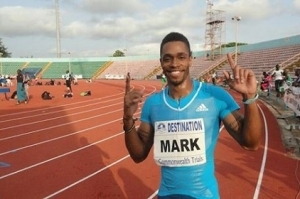 Former Nigerian Athletes, Uchenna Emedolu and Olusoji Fasuba, have frowned at the Athletic Federation of Nigeria over the inclusion of new national men’s 100 metres champion, Mark Jelks, in the team for the 2014 Commonwealth Games. Jelks, who recently switched nationality from the United States to Nigeria, was named in the 46-man squad for the Games in Glasgow after winning the Cross River State/All-Nigeria Athletics Championships in Calabar in 10.23 seconds, beating former champions Ogho-Oghene Egwero and Obinna Metu in the process. However, Emedolu and Fasuba are worried that the former American athlete had a drug related issue in 2010, which led to his two-year ban. 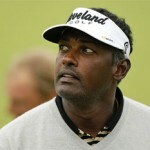 Jelks had failed to notify the United States Anti-Doping Agency of his location on three separate occasions within an 18-month period and in line with World Anti-Doping Agency rules, he received a two-year suspension, lasting from August 2010 to 2012. “It is very wrong to bring a drug-tainted American to compete in Nigeria just because we want to win at all costs. That kind of policy does not encourage the developmental programme we should have in Nigeria’’, Emedolu said. Former sprinter, Olusoji Fasuba, who holds the African record of 9.85 in 100m, doesn’t understand why the AFN would bring an athlete from America, who is a drug cheat to participate in the Calabar championships which he described as “a once glorified competition”. “It is a sad day in Nigerian athletics where a nation has to recruit drug cheats from America to participate in a once glorified competition”, Fasuba said. “It shows the head has failed its people as it can’t provide a way to make our own people (to) succeed. They bring these athletes that cannot make their own countries’ national teams to represent our beloved country.